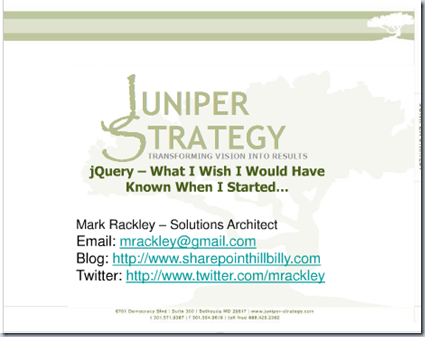 So.. SharePoint Saturday St. Louis was this past weekend and I had the honor of presenting my SharePoint & jQuery session. This session is always a lot of fun and seems to always produce some really interesting conversation from the attendees. Seems like I learn something every time I do it. Thanks to all those who attended and contributed and thanks to Matt Bremer (@mattbremer) and crew for putting on a great event! Also, I’m always looking for new blog ideas, so if there is something specific you want to see involving SharePoint & jQuery let me know and I’ll see what I can do! Next up for me is SPTechCon in Boston in June. Come say hi if you are going to be around!